In November, schools across the district recognized the unique heritage of this continent’s first people in celebrating Native American Heritage Month. On the morning of November 29, students led a Native Heritage Assembly for their school community at Nathan Hale High School. The dynamic assembly featured Native speakers, community activists, poetry, musical selections, and history lessons. Oliva Martinez, Native Club member, shared an indigenous song of welcome from the Quinault Nation. 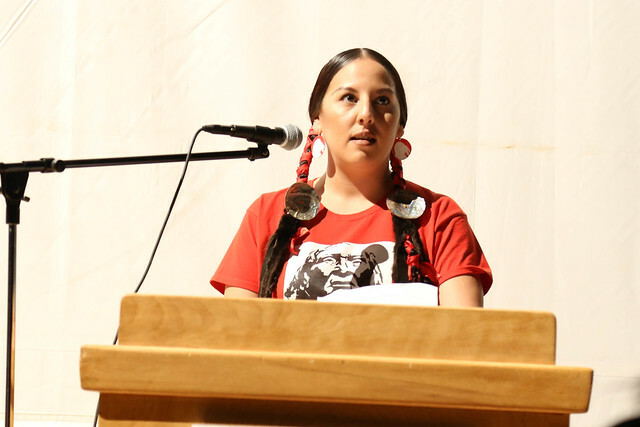 Urban Native Education Alliance (UNEA) co-founder and elected chair, Sarah-Sense Wilson was honored with the Nathan Hale High School 12th Man Award for her commitment to strengthening the urban native community, specifically around her work to support Native students at the high school. Superintendent Denise Juneau spoke to the importance of representative leadership and youth advocacy. She encouraged students to continue lifting their voices to shape future generations for years to come. Chelsea Hendrickson, community social worker, activist, and organizer, reminded the audience, “To be native during this month [November] means carrying the burden of the history of the land we occupy.” She encouraged students to continue celebrating Native culture after November 30, not to mark December 1 as the end of celebrations of Native heritage. Students watched the film "I Am Native," which showcases Native Seattle Public Schools high school students and staff sharing their stories, hopes, and dreams for their future. Seattle Public Schools recognizes and honors the important contributions to our communities made by our local, state, and country's indigenous peoples. The Seattle Public Schools Native American Education Program Manager, Gail T. Morris, and the Huchoosedah Indian Education team provide teacher resources and trainings to help school communities recognize and honor Native American heritage and support student identity safety. Below is a slideshow of photos from the assembly.